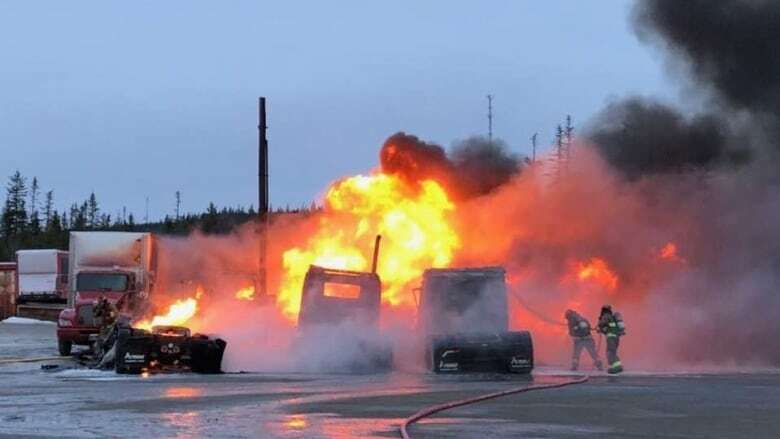 Police don't know what caused six transport trucks to ignite in Corner Brook around 6 A.M. on Sunday. Police don't know what caused multiple transport truck fires in Corner Brook on Sunday morning. 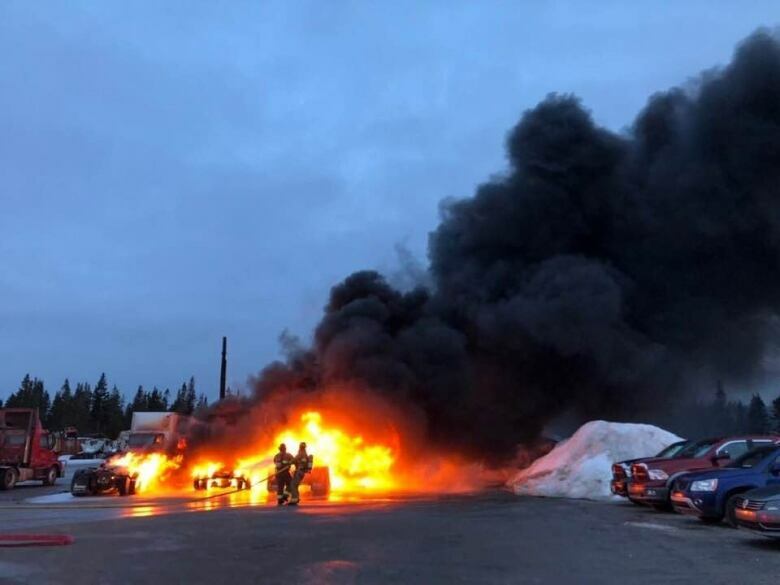 The Royal Newfoundland Constabulary received a call around 6:30 a.m. on Sunday about a large fire in the parking lot of Armour Transportation Systems in Watsons Pond Industrial Park. "When they arrived, there were a number of vehicles on fire, the large transport truck-type vehicles," said Const. Shawna Park, RNC's media relations officer in Corner Brook. "The initial truck ignited, and there were high winds, very high winds at the time, which pushed the flames over the other trucks, which were parked in close proximity to that initial truck," she said. The fuel tank ruptured on the first truck and fuel moved toward the other trucks, causing a domino effect of fire. All the vehicles were destroyed. "It was quite intense for a little while," said Park. "The quick action of the Corner Brook fire department got it under control." No one was hurt, and nearby surveillance footage helped the fire investigator determine that no one was around the vehicles at the time of the fire. Park says the fire isn't suspicious and the investigation is now over. "Absolutely not suspicious. Nothing that was caused by any person, Just one of those things that sometimes happens with vehicles," said Park.